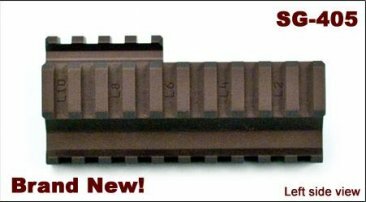 Arsenal, Inc. > Quad Rail System > Rail System, Quad Rail for Saiga 12 Shotgun, Arsenal Inc.
Rail System, Quad Rail for Saiga 12 Shotgun, Arsenal Inc.
Arsenal Inc.s own 4-sided Picatinny rails for the Saiga 12 are finally here. The new SG-405 quad rail system attaches directly to the shotguns barrel, allowing any accessories mounted on the rails to be aligned with the barrel. The system attaches in front of the handguard and the gas block leaving the handguard for a more comfortable grip and feel while shooting. The SG-405 system utilizes Arsenal Incs new retainer (SG-338) and handguard (SG-022) for Saiga 12 shotguns and is a breeze to install. The SG-405 is the same quad rail system that is featured on Arsenal Incs SGL12-03 shotguns. These rails are manufactured using CNC machines that allow for very tight tolerances, upholding Arsenal Incs legendary quality standards, and are designed to accept any military spec accessories.